Originally the scientific name for banana was musa sapientum, meaning ‘fruit of the wise men,’ it could very well been called musa ludum or ‘fruit of the sportsmen.’ Besides being a good source for vitamin C, potassium and dietary fiber, they are great for sports and workouts because they replenish necessary carbohydrates, glycogen and body fluids burned during a game or exercise. As such a Banana Shake makes for an apt pre-match or pre-exercise drink. Add to that Spinach and you have unlimited Popeye power to tap into. 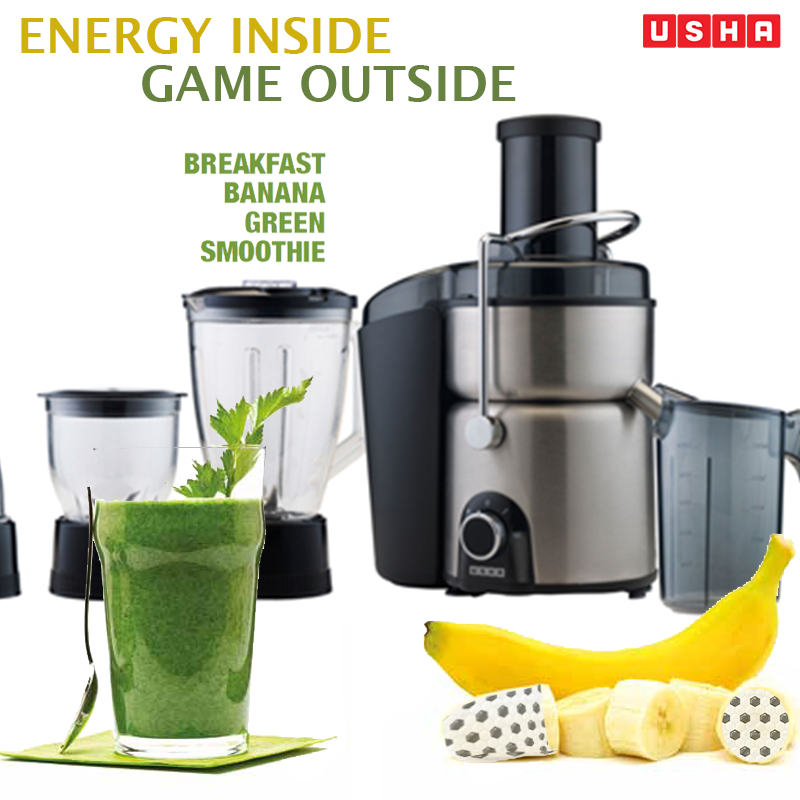 The best place to make this one-of-a-kind Banana Green Smoothie is the Usha JMG 3274, which features fully safe operation with 5 different functions, Anti drip spout and Overheat protection for safety. The Juicer Mixer Grinder’s large feeder tube for full fruit juicing will help you fit in all the ingredients nice and proper, while the safety function ensures that the Juicer does not operate unless properly fitted. Its 5 functions include – Juicing, Blending, Mixing, Light grinding and Mincing. That’s like having your own food preparation Team! Place spinach, banana, carrot, yoghurt, ice and honey in a blender; blend until smooth. This entry was posted in Healthy Living, Juicing and tagged Health & Nutrition, Usha Juicer by Blogger. Bookmark the permalink.